It’s almost Father’s Day here in the U.S., so I want to use the occasion to remind everyone that God is not like a Father. This holiday, along with Mother’s day, is both a wonderful and a difficult time for parents and children alike. It is especially hard for those who had difficulty with their parents, or parents who feel estranged from their children. It’s even more difficult for children and parents in these circumstances who go to church on these holidays, many of which will be sharing messages about the importance of motherhood, or the blessings of being children of our heavenly Father. For more people than we can count, likening God to a father brings up painful memories of childhood (or adulthood), and varying levels of pain, regret, and confusion as they try to set their image of “father” next to their understanding of God. God is not like a father. Stop. Go back. Read that again out loud. God is, rather, like this father. The father who shows mercy to his children. The father who extends grace. The father who, even in his discipline, is set on restoration. The father who bears the shame and the cost of the failures of his children. The father who runs to them when they are far away, and brings them home in joyful celebration. All of this reflection sent my mind back in time to the months following the adoption of our son, Victor. He was three years old when we brought him home. Like most other fathers, I began trying out all of the “dad” stuff that I learned from my dad, and from other men whom I respected. Some of it was good, and some of it was not. It was not the voice of my earthly father. It was the voice of my heavenly Father. In that moment I was shocked and humiliated at my failure to teach my son what God is really like. I had to turn around, go back to him sitting on the couch (looking at me and wondering what would happen next), and gently kneel down next to him to apologize for the way I treated him. He deserved correction and discipline, but I did not treat him right in the way I carried it out. Over the past eleven years, my son and I have learned to apologize to one another and make things right on the basis of how a son should respect and respond to his parents, and how a parent should respect and respond to his children — even when they do wrong. I admit that I do not have it perfect (not even close). But this I do know… God is not like a Father. No. 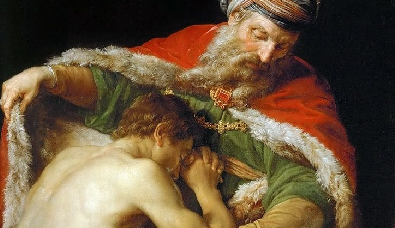 He is like this father in the parable of the prodigal son. So true. Jesus doesn’t simply use the word “father” and then leave his hearers to use their own broken image of father to set next to their understanding of God. He tells them — and he tells us what our Father in heaven is really like. He is like this father.